We know that each person who walks through our doors has a unique financial situation and goals that deserve a uniquely crafted strategy. There is no "one size fits all" approach to achieving long-term financial freedom and security. To that end, we utilize a multi phase process to identify and understand your unique circumstances and create a strategy that fits your needs and goals. 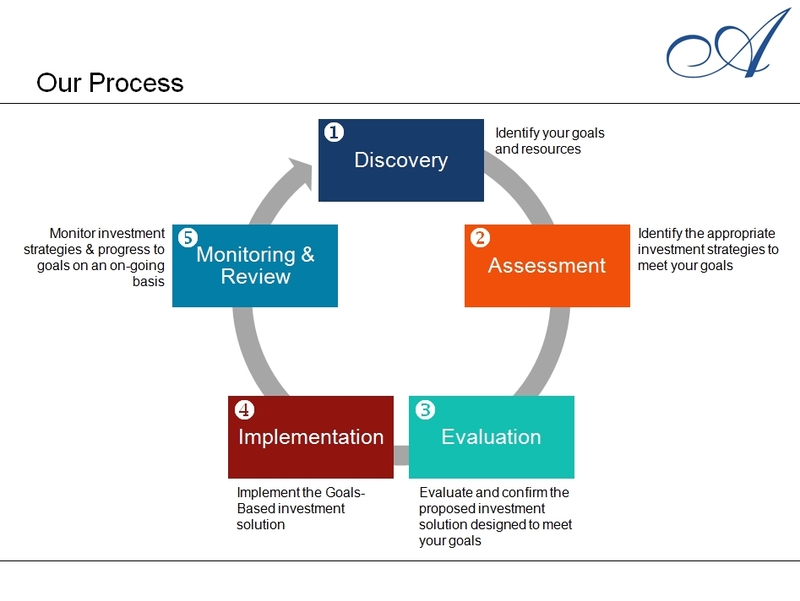 In our initial discovery phase, we gather information regarding your current financial situation and investment goals. This helps us better understand you and the values, priorities, and challenges that you have. This knowledge is important to us, to set the foundation for our entire relationship. After gathering the information from the discovery, our team of professionals will study your situation diligently and craft a tailored strategy to fit your values and achieve your goals. Two of our firms core values are communication and education. We will clearly and concisely present our recommendations to you and work with you to evaluate how they meet your desired outcome. Our goal is to build a strategy that addresses all the pieces of your financial life, making sure they work in harmony, to achieve your goals, within your risk tolerance. As an independent firm, we have the ability to utilize a wide variety of products, further adding to your customized plan. Our partnerships with some of the industry's leading investment companies, allows us to execute and manage your strategy in the best way possible. We actively monitor all of our client's investment strategies and on an ongoing and regular basis we will meet with you to review our progress towards our goals. Our review also allows us to identify if any changes to your strategy are necessary.